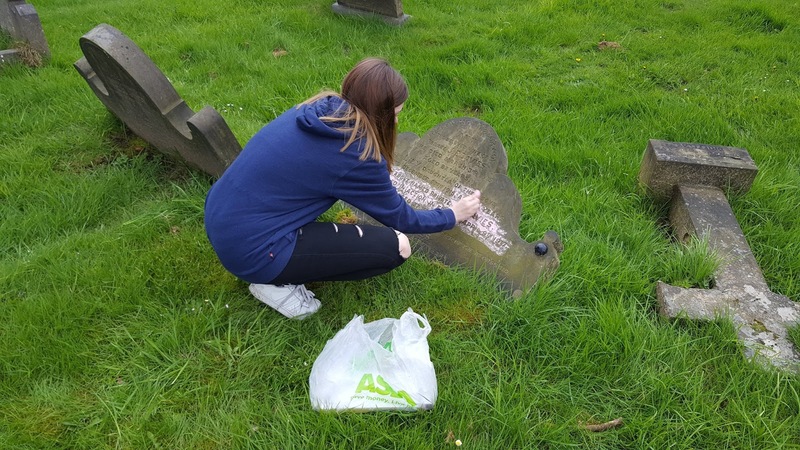 Since March this year a kind Barnsley volunteer named Wayne Bywater has been walking around Ardsley and Barnsley Cemeteries photographing war memorial gravestones. He submits these to the Barnsley War Memorials Project (BWMP) and via Twitter to me. My file of his photos contains 103 images! The Barnsley War Memorial Project now have records of 112 war memorial gravestones in Barnsley Cemetery alone, but sadly many of these are in very poor condition. Without volunteers like Wayne these memorials may not ever have been recorded and in a few years many could crumble away as if they never existed. The Imperial War Museum's War Memorials' Archive defines a War Memorial as "any tangible object which has been erected or dedicated to commemorate those killed as a result of war, conflict or peacekeeping; who served in war or conflict; or who died whilst engaged in military service." This includes gravestones which commemorate a casualty buried elsewhere. There must be a clear statement on the memorial (or in a printed document such as a newspaper report from the time) that defines the commemorative purpose of the feature and reports its erection. Thus gravestones which include wording such as: died of wounds received in action, killed in action, fell in France, died on active service, reported missing in action, or even killed accidentally while on active service all count as War Memorials. The wording is a "clear statement" that the purpose of recording that person's name on the gravestone is as a memorial. All credit to Wayne for spotting the significant wording on this pile of broken stones. 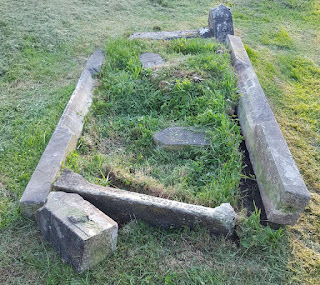 Three of the corners of the grave kerb edging have broken away and are lying down. There appears to be an inscription on both long sides and one end. Zooming in on this photo I can see that Ann Outwin is commemorated on the right and Elsie on the left. As both inscriptions start with the word 'Also' I think there should have been an inscription at the top of this plot as well. Wayne also provided a close up of the relevant war memorial part of the inscription. That "Killed in France" and the date is what makes this a War Memorial. 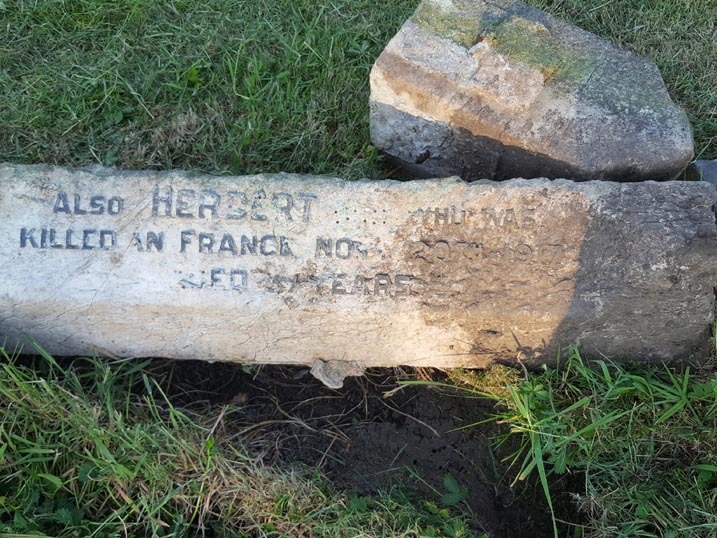 It is only by combining the information from all the inscriptions that we can work out that Herbert's surname was Outwin. I looked up these names in an index to the burials in Barnsley Cemetery (available from Barnsley Archives) and found that Ann and Elsie Outwin were buried in plot M 826 in Barnsley Cemetery. Ann was 78 years old when she died in 1926, Elsie was 50 in 1941. Also in the plot are Ethel who died aged 9 months in 1890 and James who died in 1921 aged 78. I assume from this that Ann and James were Herbert's parents and that Ethel and Elsie were his sisters. Herbert's name rang a bell with me and I looked him up on the BWMP master spreadsheet. He was 37 years old when he was killed in action on 20 November 1917. He is buried in Flesquieres Hill British Cemetery in France. His wife was called Jane and she lived on Eldon Street North. He is mentioned on the Barnsley St Mary's War Memorial and he is mentioned twice in the Barnsley Chronicle during the years indexed by the BWMP volunteers. I have started to add more information to Herbert's Life Story on Lives of the First World War. This site is free use if you want to browse and add photos and free text family stories to your relatives. 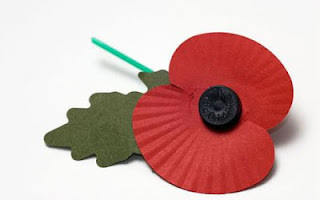 You only hit the paywall if you want to access the military and historical records provided and, *handy hint* these are available free of charge in Barnsley (Ancestry) and Sheffield (Find My Past) libraries. I was sure there was something else about this man so I also searched for the name Outwin in my husband's family tree. Sure enough he appears there, married to the sister of the wife of my husband's great, great uncle Thomas Croft (of 'Daring Escape from Holland' fame). Thomas's wife was Matilda Dutton, older sister of Jane. Herbert and Jane had at least six children, Herbert b.1907, Ernest b.1908, George b.1909, Harold b.1910, Leonard b.1912 and Gladys b. 1916. Jane also came from a large family, as she and Matilda were the youngest of at least nine children born to George and Eliza Dutton in Monk Bretton. Between the Outwins and the Duttons there must be lots of descendants and relatives of Herbert still living in Barnsley. The care of gravestones falls to the owners of the graves and their next of kin according to Barnsley Council. They are not the responsibility of the Commonwealth War Graves Commission or the War Memorials Trust. 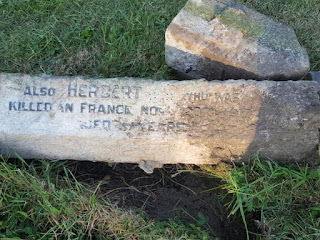 Please could someone take responsibility for this grave and show Herbert the respect he deserves. This is not the only damaged and poorly maintained grave plot in Barnsley Cemetery. If you are lucky enough to have a family memorial of any kind (and in my husband's family many of his ancestors were too poor to buy a stone and are buried in unmarked grassy plots) then it would be nice if we could care for them.